Ebisinde has eyes for one girl and one girl only and that’s Diana, however she’s not interested and sees him as a small boy. He feels that the way to win her over and get her attention is by showing her that he’s a BIG BOY, however on his schoolboy budget – this is proving difficult. Ebisinde also wants to step up and be the man of the house to look after his sister’s, Faa and Tare. He believes the best way to get his dream girl and take care of his sister’s is by making some fast cash; while his intentions are good, will Ebsinde and his friends find themselves in trouble in their pursuit for riches? Abayomi Alvin has been making a name for himself as an actor since 2013 when he played the role of Nosa in ‘Isoken’. Since then, he has starred in numerous films including ‘30 pieces of Silver’ while also broadening his horizons to television. Abayomi has starred in shows such as ‘Jemeji’ and ‘Jenifa’s Diary’ (he’s also part of the writing team for the latter). 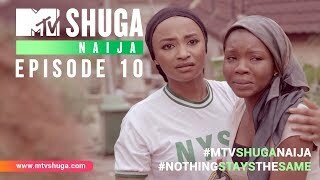 Look out for his character, Ebisinde, on MTV Shuga Season 6.